DACC and Buckeye Valley senior Veronica Leist sits in the app development lab at the DACC’s south campus Monday. Leist is part of the app development program at the DACC, and she was recently awarded a scholarship for women aiming to study video game development. Leist said she will be studying game design at Shawnee State University. A Delaware Area Career Center student was recently accepted and given a full-ride scholarship to Shawnee State University to study game design. 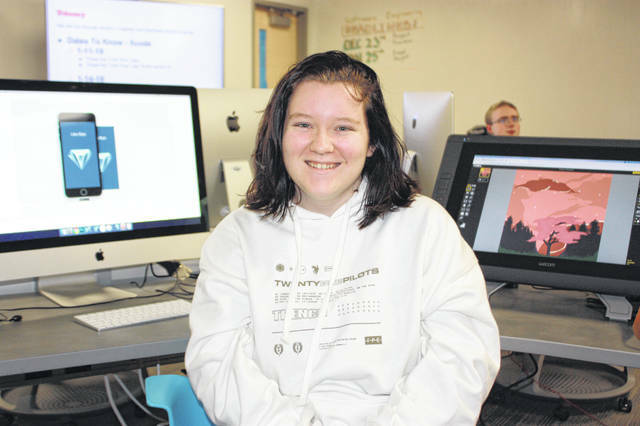 Veronica Leist, a senior at Buckeye Valley High School currently studying app development at the DACC, said she applied for a scholarship for women looking to join the field of game development at Shawnee State University in Portsmouth, Ohio. Last semester, she received life-changing news. Leist said she applied to Shawnee State because the game design program is very strong, and because it’s somewhat local. Leist said she’s had an interest in designing video games ever since she was a kid. Leist said video games as a medium have changed since she was a kid, and now they carry messages and emotion. Leist said getting her acceptance letter and scholarship so early has helped her relax, but she’s still focused on learning as much as possible before college. https://www.delgazette.com/wp-content/uploads/sites/40/2019/02/web1_ADP_VeronicaLeist3.jpgDACC and Buckeye Valley senior Veronica Leist sits in the app development lab at the DACC’s south campus Monday. Leist is part of the app development program at the DACC, and she was recently awarded a scholarship for women aiming to study video game development. Leist said she will be studying game design at Shawnee State University.